Giant hogweed (a.k.a. giant cow parsnip) is native to the Caucasus region and is introduced and invasive in Europe and North America (Krinke et al. 2005) where it is found in moist to wet disturbed sites. In North America, it is reported from several US states (CT, IL, ME, MI, NY, OR, PA, WA) and some Canadian provinces (BC, NB, ON, QC) (USDA 2010). In British Columbia, it is found in the southwestern corner of the province, along the eastern edge of Vancouver Island, on the Gulf Islands, and in the Lower Mainland. It has recently been reported in the Kootenays in the southeastern region of the province. Giant hogweed belongs to the genus Heracleum in the the carrot family (Apiaceae). This genus consists of about 80 species worldwide (found in Eurasia, east Africa, 1 in North America), and is comprised of biennial or perennial herbs with taproots or clustered roots; species in the genus may be glabrous or hairy with erect stems that are usually branched, thick, and hollow (Ganders 2010). Giant hogweed is generally a tall (1.5-5 m), distinctive species that is readily recognized by its large terminal umbels of white flowers and large leaves that are deeply divided into three palmately-lobed segments. It produces abundant seed (20,000 seeds per plant), and dies back after flowering and seed set (Marrison and Goerig 2010?). Similar to H. lanatum except: Biennial to perennial. Stem (1.5) 2-4.5 m tall, up to 10 cm in diameter, usually with purple blotches. Stem (1.5) 2-4.5 m tall, up to 10 cm in diameter, usually with purple blotches. Leaves up to 3 m long, blade to 2.6 cm wide, ternately or pinnately divided, lateral segments pinnately lobed, short-hairy below. Inflorescence, larger ones, 20-50 cm in diameter, rays 50-150. Petals white or rarely pinkish. Fruit blunt and rounded toward base. This plant can cause severe dermatitis when handled. Account Author:: Fred Ganders, 2010. Habitat wet to moist disturbed areas in the lowlands, garden escape, well established in Vancouver, North Vancouver, West Vancouver, native to Asia. For further information about control of this species, visit the Great Vancouver Invasive Plant council web site. It is listed by them as one of the top twelve species of concern in the Vancouver Region. It is also listed by the Coastal Invasive Plant Council as one of the top fourteen species of concern on Vancouver Island and adjacent coastal areas. Visit their web site. Although giant hogweed is readily recognized by its very large size, smaller individuals may be mistaken for other species. In wet sites (ditches and shorelines), giant hogweed is most commonly mistaken for the native cow parsnip (Heracleum maximum). Cow parsnip ranges in height from 1-3 m and is generally a smaller plant than giant hogweed. However, the size range for the two species overlaps and small plants of giant hogweed may be mistaken for cow parsnip while taller plants of cow parsnip may be mistaken for giant hogweed. 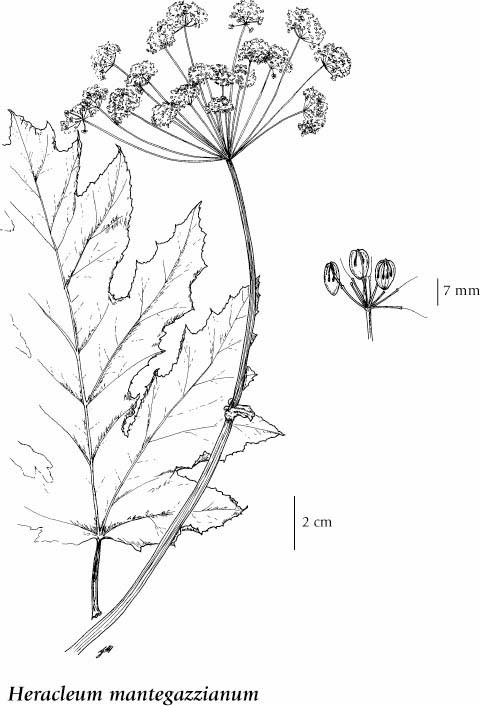 Fruit characteristics, leaf form, and number of rays in the flower umbels (15-30 rays in cow parsnip and 50-150 in giant hogweed) can readily separate these two species (see the identification key below), along with the purple blotching on the stem of giant hogweed. Additionally, cow parsnip is common and widespread throughout BC and is found at elevations up to 2750 m, while giant hogweed is not common, and is found primarily in the lowland zone in southwestern BC. Giant hogweed is also sometimes mistaken for other species with white umbels of flowers such as poison hemlock (Conium maculatum). However, poison hemlock is generally much smaller and less robust than giant hogweed, with fern-like leaves and smaller umbels. Giant hogweed has also been mistaken for other wet-loving members of the family, so care should be taken in the identification. Ganders, Fred. 2010. Personal communication. Unpublished material. Krinke, Lukas, Lenka Moravcováa, Petr Pyšeka, Vojtech Jarošíka, Jan Pergla and Irena Perglováa. 2005. 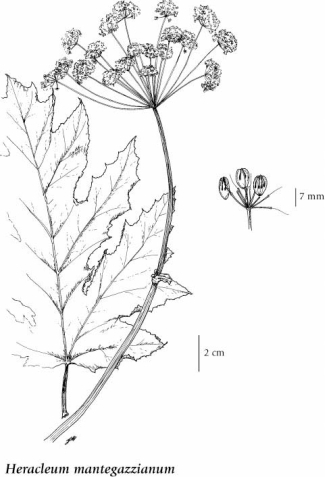 Seed bank of an invasive alien, Heracleum mantegazzianum, and its seasonal dynamics. Seed Science Research 15: 239 to 248. Marrison, David L. and David J. Goerig. 2010?. Giant Hogweed (Heracleum mantegazzianum) Fact Sheet. Ohio State University Extension Fact Sheet. Available Online. USDA. 2010. Plant profile for Heracleum mantegazzianum. United States Department of Agriculture Plants Database. Available Online.